​"Then Earth Doctor took from his breast a little dust and flattened it into a cake. When the dust cake was still, he danced upon it, singing a magic song. until it was as large as it is now." Intuitive sound healing sessions customized to your needs. At your home or my Sound Healing Temple. At my Sound Healing Temple or in your home, workplace, or meeting place. These healing ceremonies are for groups of up to 12 people. These special sound healing events are for larger groups. They work well in yoga studios, churches, and schools, and are excellent fund raisers for your group or cause. 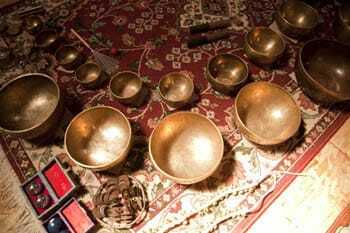 Each concert is followed by a Q&A session on sound healing and the instruments used. These sessions can be customized for your group. Please call for rates. Do you have trouble sitting still or quieting the chatter in you mind? Let the voices of the Gongs carry you to a place of timeless peace and solitude. Master Circles provide experienced, practicing sound healers with an opportunity to sit with other healers in an open exchange of healing philosophy and techniques. These Circles can be formatted as one day or weekend sessions.